The Oakville Rangers received two-goal performances from Adam Craievich and Sean Kohler to capture their first OHL Cup title by a score of 5-1 over the Toronto Marlboros at Herb Carnegie Arena in North York. Craievich, who also scored twice in Oakville’s 6-1 Semi-Final win over the York Simcoe Express, was named Player of the Game and finished with five goals and seven points in seven games to earn the Tim Adams Memorial Trophy presented to the Tournament’s Most Valuable Player. Marlboros Player of the Game Mitchell Stephens put his club on the board early in the second period to tie the score 1-1, but the Rangers pulled away with a pair of second period goals of their own followed by two more in the third period to secure the victory. Adrian Clark earned the win in goal for the Rangers finishing the tournament with a 3-1-0 record including a shutout victory and a tournament best goals-against-average of 0.75. The top ranked OMHA Champion Rangers were making their first appearance in the OHL Cup Finals since the tournament became a minor midget showcase in 2003, up against the second ranked GTHL Champion Marlboros who were making their seventh straight OHL Cup Finals appearance collecting tournament victories in 2011 and 2009. Head coach Duncan Harvey’s Rangers overcame a slow start to the tournament that saw them tie the Huron Perth Lakers and lose to the Central Ontario Wolves to earn a playoff spot with consecutive shutouts to end the round robin. The Rangers had to overcome a Quarter-Final scare from the Halton Hurricanes. 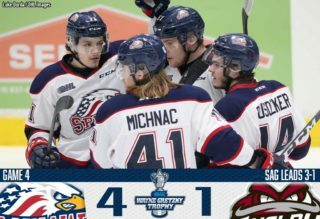 They trailed 1-0 with just minutes to play, but Brett McKenzie spoiled Hurricanes goaltender Michael McNiven’s shutout bid with 3:09 left in the third period and Kyle Capobianco won the game with an overtime power play goal. “To think that we were about three minutes away from getting knocked out, to where we are today, just shows these guys have done a great job at fighting through adversity,” said Harvey. Craievich and Mark Bzowey, who also scored twice in the Semi-Final, led the team past the Express and into the final against the Marlboros. The Marlboros finished second in their division behind the Barrie Jr. Colts, who went through the round robin undefeated. 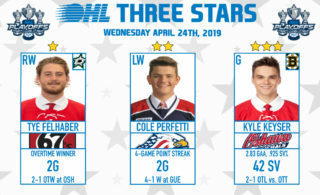 They knocked off the Elgin Middlesex Chiefs and TPH Thunder in two tight one-goal games to earn their place in the Championship. 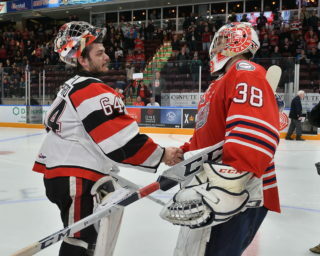 Spencer helped the Rangers become the first OMHA club to capture an OHL Cup title since 2006 when Steven Stamkos and the Markham Waxers defeated the Toronto Red Wings. The Rangers yielded a tournament-low four goals against in the round robin. They kept up their stingy defensive play in the playoffs, surrendering just one goal against in each of their three games. 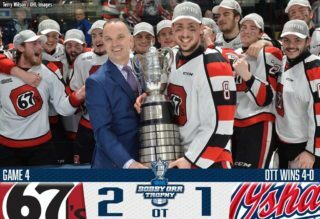 Hockey Night in Canada star and Minor Hockey advocate Don Cherry presented the OHL Cup to Spencer, with Gold and Silver medals presented by OHL Commissioner David Branch as part of the post-game ceremonies. For more information about the OHL Cup Showcase Tournament presented by Visit Orlando and hosted by the Greater Toronto Hockey League please visit www.ohlcup.ca.